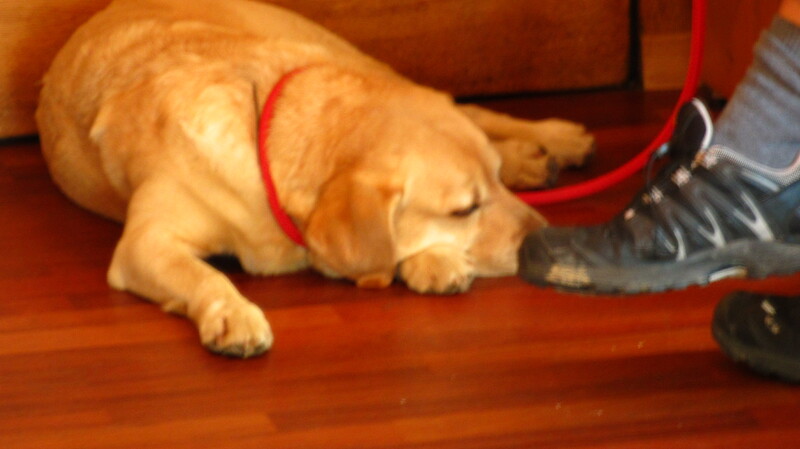 A dog snoozes at his owner’s feet, happy inside a Starbucks restaurant. A dog attacked me on my morning jog yesterday. It was leashed to a young woman who only laughed as her snarly snapping border collie made a go for my shins. I say “only” because she showed no reflexive movement to her dog’s lunging at me. A little jerk of the leash would have been nice, but that did not occur. That is about what I expected. My experience of dog-owners, particularly owners of aggressive dogs, is that they are clueless about their beloved Bowser’s behavior, because they are at the tail-end of the leash. The view is different from the other side, the one with fangs. This brought to mind my hometown Victoria, British Columbia, where tightened leash laws came into force this week, a move that I doubt will do much except produce a more stressed dog population. I loathe it when North Americans shore up weak arguments with “that is how they do it in Sweden” defenses – a lazy myopic debating tool if ever there was one, mostly because people using that device are operating with a scant understanding of how Sweden or any faraway land really works. But here I am about to dive in with a “this is how they do it in Switzerland argument” against tighter leash laws. My only defense is that I live in Switzerland. Over the past year, we have seen countless unleashed dogs of all breeds trot past us with nary a glance in our direction. Un-neutered males frolic in parks, beagles bumber about inside housing goods shops as their owners browse, retrievers relax under restaurant tables and train-riding chows tolerate total strangers stepping over them. Unleashed dogs walk at a perfect heel on busy streets and in packed parks. A dog is a dog the world over, so the difference has to be something to do with the Swiss. I had previously believed Swiss dogs’ docile natures was a product of their socialization – that is, that they are allowed nearly everywhere: Trains, buses, stores (some restrictions apply inside grocery stores), malls, wherever there are people, there are dogs. I assumed this to be the driving civilizing effect on canines and very likely this is the case. But there is more to it. Switzerland is swathed in bureaucracy. For example, no one is allowed on a golf course until they have been certified. It seems a bit far-fetched but there it is. The same thinking applies to dog-ownership. Switzerland demands that dog-owners become certified before they actually own a dog, and certification does not mean just paying a fee and getting a piece of paper; it means taking a course in dog-training. After successfully completing the course, the person then gets the dog and later goes back for further training and certification. Fifteen months ago, learning this would have made me roll my eyes and groan at an all-reaching bureaucracy, but now it seems like a very good idea. It elevates the general base of knowledge of all dog-owners. The result is a very polite pooch population. A leash law would not have done anything to protect me from yesterday’s dog-attack. The problem was not with the dog on the leash, but with the obtuse woman holding the other end of it. 17: Pick a Language, Any Language. 19: Why Do We Care About Ducklings? 23: No money, money, money. Archive Calendar: Click on date to see archived posts. ho·bo [hoh-boh] noun, plural -bos, -boes.1. a tramp or vagrant. 2. a migratory worker.Too cheap to book a travel vacation, we see far-off places by signing on for a short-term jobs. It's balanced-budget travel at its best. Everyone loves a country so filled with chocolate that they have to stack it. Write a novel in a month, what insanity. Novel Update: For those who are interested in this sort of thing, I finished a very rough draft of my second novel in November 2011, a very grey and drizzly month in Switzerland, which also happens to be perfect writing weather. After multiple editings, it is out searching for a home. Fingers crossed, it will find one.